Sander Hoogendoorn is an independant dad, consultant, software craftsman, architect, programmer, coach, personal mentor, speaker, traine, writer and traveller. He is seasoned in (beyond) agile, Scrum, Kanban, continuous delivery, (no) software estimation, agile requirements, design patterns, web development, domain driven design, UML, software architecture, microservices, and writing beautiful code. 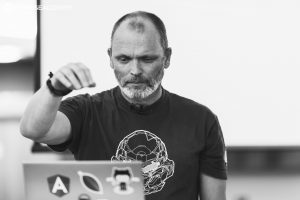 Sander changes organizations and teams and coaches them to optimize their processes, practices, architecture, code and tests, currently as chief technology officer at ANVA, previously as the CTO for a well-known Dutch insurance company and as global agile thought leader at Capgemini. Sander authored best-selling books such as Microservices. A practical guide, The Continuous Culture, This Is Agile and Pragmatic Modeling with UML and published hundreds of articles in international magazines. He is an inspiring (keynote) speaker at international conferences, he presented hundreds of (in-house) training courses and lectured at many universities. Sander is well known for his enthusiasm and motivational capabilities, innovative skills, team building, deep knowledge of the field, quick adaptation, broad vision, and collaborative skills. An open personality, eager, driven, out-of-the-box thinker. He is not afraid of trying out new paths and techniques and has never been a nine-to-fiver. Having new ideas is a 24/7 process. Sander has written books on UML and two on agile software development (also see www.ditisagile.nl). He hopes to find the time to write new books on Smart (the agile methodology), smart use cases (also see www.smartusecase.com), pragmatic software architecture and patterns for .Net (and Java and PHP), project anti-patterns, agile anti-patterns and perhaps even a Dummies-like book with hundreds of tips on visiting conferences. Sander has published numerous articles and columns in international magazines, such as Agile Record, InfoQ, OBJECTSpectrum, International Developer Magazine, DevX, Software Release Magazine, .Net Magazine, Optimize, Informatie and Database Magazine, Tijdschrift voor IT Management. Sander is also a columnist for Software Release Magazine and SDN Magazine and a member of the editorial board of Tijdschrijft voor IT Management (TITM). Besides that Sander is a frequent and enthusiastic (keynote) speaker at Dutch and international conferences, which include OOP, W-JAX and Microsoft TechEd (Germany), JAOO (Denmark), SET and Jazoon (Switzerland), Javapolis (Belgium), ACCU, TDWI, DW&I (UK), Microsoft TechDays, DevDays, SDC and Database Systems (the Netherlands), SOA & Cloud Symposium (Brazil), CodeFest (Russia), Voxxed Days (Greece), BuildStuff Spain (Spain), GIDS (India), Devvox, DevConf (Poland), GeeCon (Chech Republic), XPDays and .NETWork (Ukraine), Agile Mammoth Games (Rumania), Devvox, Javapolis, Techorama (Belgium), SwanseaCon (Wales), GeeCon (Chech Republic), Software Quality Days (Austria), BuildStuff (Lithuania), Microsoft TechEd (US). Sander also runs seminars and workshops on microservices, continuous delivery, UML, design patterns, and agile in the Netherlands (at Array Seminars), Belgium (at IT Works) and in Italy (at Technology Transfer). Have been in software development for over 30 years. I first started programming when I was 14 (on my Commodore 64), wrote my first commercial software (and my first framework) at the age of 18 in Pascal. Thirty years down the road, I still love to write code. Have gained knowledge and expertise on a wide variety of both technical and non-technical subjects, including software architecture, agile, Scrum, requirements, (smart) use cases, software estimation, tooling, coding, design patterns, service oriented architecture, software testing. Have worked for major IT consultancy companies for 20 years, currently Capgemini, and worked with large (and smaller) clients all this time, including financial institutions, industrial companies, organizations in transportation, healthcare, oil, government agencies, retail, education, insurance companies, etc. Have coached organizations, teams, projects and individuals. I have organized processes, workflows, techniques, practices, communication and collaboration in co-located and distributed teams. Have trained many, many (international) organizations and teams on a wide variety of subjects. I must have presented over 300 training courses over the past 15 years. I also have presented guest lectures at every major university in the country. Have written books on agile, UML and recently again on agile. This last books has been translated to German. You could say agile is in my blood. And I have also published over 200 articles and columns in international magazines. Just started on two new books (on software architecture, patterns and code, and on agile anti-patterns). Have presented over 100 keynotes and talks at international conferences around the world on agile, requirements, modeling, software architecture, patterns, code, .NET, Java, testing. Am known for my warm enthusiasm and motivational capabilities, my innovative skills (an idea a day keeps the doctor away), team building skills, deep knowledge of the field, quick adaptation, broad vision, and collaborative skills. I am also an open personality, eager, driven, sometimes a bit off-beat, somewhat unconventional, out-of-the-box thinker and not afraid of trying out new paths and new techniques. Have never been a nine-to-fiver, for me having new ideas and trying them out is a 24/7 process. Also, I have a supporting girlfriend, three kids, good friends, and a broad network, I'm an amateur photographer, play a bit of guitar, love to travel, play indoor football (still at the age of 48), go to concerts, and I still love to write code (wouldn't want to miss that).